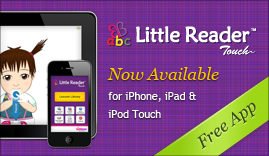 How is Little Reader different? For a detailed comparison of Little Reader with other products, please see here. My child already knows how to read basic words from [XYZ program]. Will this be useful? The English curriculum alone shows over 2,300 words in 234 Categories, from single words, to couplets, phrases, sentences, and stories, and so there are likely to be many more words that your child will not be familiar with. The curriculum also lays down a strong foundation for learning phonics with the Pattern Phonics™ lessons, making sure your child learns the essential skill of being able to sound out new words he/she has never seen before. The color-coding function that comes with Little Reader also helps your child start to see words in their constituent parts (such as in different syllables, or even broken up into consonants, vowels and blends). Even for words with which your child is already familiar, Little Reader can be set to show the words in upper case and even custom fonts (such as cursive fonts), ensuring your child has a better grasp of all the different ways that words may appear in everyday life. Little Reader's library is infinitely expandable! Not only can you customize your child's lessons to include words particular to your culture or locality, you can also download literally thousands more files from our online download library, many of which are for advanced readers, even teaching encyclopedic knowledge. The vast majority of these files can be downloaded for free, and the others are premium files which require loyalty points that can be purchased or earned for free through forum activity. Little Reader is also commonly used to teach foreign languages, and there are already over a thousand foreign language files in our online download library. We also have the Little Reader curriculum available in Spanish, French, Russian, Thai and Chinese, sold separately as add-on packs. Full editing features and Library downloads can be accessed with PRO KEY for LITTLE READER. Are computer screens safe for young children? Many people have negative associations with TVs and computer screens, especially concerning children, but the reasons are mostly not applicable anymore with today's technology. Old-style TV sets and computer monitors (big chunky ones, known as CRT or cathode ray tube monitors) produced significant amounts of radiation and had low refresh rates which cause eye-strain for some people who gaze at the screen for hours. The situation is much improved with today's LCD monitors, which have higher refresh rates. TVs in general also get a bad reputation because, for example, the American Academy of Pediatrics advise that babies below 2 should not watch TV. However, the reason has nothing to do with the TV itself, but with the CONTENT shown. Programs like those on the Cartoon Network have rapidly changing images which bombard children with stimulation, and watching such programming for a long time may desensitize them to other stimulation, which may even lead to attention deficit disorder. With Little Reader, the lessons last just a few minutes each day and the content is especially designed to teach music concepts in small chunks at a time. Does Little Reader teach phonics? Phonics plays a large part in Little Reader lessons, as phonics is a critical skill that every child must master. In many of the videos showing young children reading, many of those children are not reading phonetically, but rather, they are reading by recognizing the entire word. This is called "whole word reading", or "sight reading". What many people do not realize is that over time, with a lot of exposure to words, children are able to pick up the rules of the written language (ie., phonics) themselves naturally and intuitively, similar to how they pick up patterns of the spoken language. A native English speaking child does not need to be taught language rules like adding an 's' to plural or adding an 'ed' for past tense, because they hear enough of the language to be able to figure out the rules and apply them to new situations. That's why you sometimes hear mistakes like saying "gooses" instead of "geese", because they picked up the pattern of adding the 's' and applied it to "goose". And this is a good sign, because it shows that they pick up patterns easily. Similarly, they are able to decode the written pattern by themselves, naturally and intuitively. With Little Reader, we encourage this natural way of learning phonics using our Pattern Phonics™ system, where we teach phonics by not teaching, but rather by letting the child figure out the phonics rules herself gradually and intuitively. Little Reader not only taps your child's natural ability to recognize patterns, but makes it as easy as possible for her to do so - by showing group after group of word patterns, and even color-coding the letters to make the patterns as obvious as can be! (See Pattern Phonics™ lesson sample here.) Pattern Phonics™ lessons start on Day 1 of the curriculum. If you were to rely solely on the traditional way with teaching phonics, then you would have to wait until the child is about 3 years old when she can enunciate sounds. You would first have her learn A to Z, and once that has been memorized, teach her that A is "ah", B is "buh", C is "cuh", etc. After that, you teach them to put sounds together like B + A + T makes the "BAT" sound. This is a very logical, LEFT-BRAIN way of teaching, and is how adults are used to learning. However, we do not believe that it is the easiest way for very young children to learn. We also believe that using the Pattern Phonics™ system, phonics rules can be taught long before a child turns 3. What age is this suitable for? What about older children? Whether or not Little Reader is appropriate for your child is not so much to do with age, but your child's reading ability. You can start using Little Reader as early as 4-6 months, but many parents are also using it on much older children, especially when introducing a foreign language. Note that different children react differently to Little Reader at different ages. Some don't pay attention when they are 1, but they suddenly take a big interest when they turn 2, and vice versa. All kids are different! We are also localizing the Little Reader curriculum in more major languages, and these may be purchased as add-on packs when released. Alternatively, you can create your own lessons in any language you'd like to teach, OR you can download additional content files in different languages from the BrillKids Library. Firstly, our strong advice is NOT to focus on results. Focusing on results tends to bring about negative emotions such as anxiety and disappointment, which will be picked up by your child. Instead, treat lesson time as a time for bonding with your child. The aim is to expose your child to reading and to have fun while doing so, thereby giving her a joyful and loving experience. Keeping a bonding-focused mindset will make you a much more effective teacher, and you are also likely to find that your child learning to read is a very pleasant side-effect. Having said that, it is very difficult to say when you would start to notice that a child has started to remember words. All children are different and develop at a different pace. A lot also depends on when you start and how much your child is enjoying the lessons. Some parents who started early (eg., at 5 months) started noticing that their child can recognize some words as early as 9 months. Some parents who started later (eg., at 2 years) notice this even after 1 month. Some parents have reported that their children never showed any signs of learning for many months, until suddenly one day they read out words that they see in the street. Whatever the case, always remember that this is not a race! Any exposure to reading that you give to your child during the early years will already be very beneficial. How many computers can I install it on? Your license allows you to install our software on ONE computer at any one time. When activating your license key, your activation record will be registered in your BrillKids member account. If you change computers, simply access your member account online and remove the activation record to free up a spare slot. Note that you can remove your activation record to free up an activation slot - this is especially useful when you change or upgrade your computers. You can also do this when you need to reformat your hardware. You may remove your activation record for a total of 2 times. Beyond this, we will need to verify your identity to make sure that your license key has not been compromised. Why Teach Reading at an Early Age?